We’re almost ready to let you explore the world of Black Desert, but before we open up the doors, we want to quickly go through the things you will be able to do this beta. We will also be opening our official Discord channel during the beta. If you’re interested in joining the discord, head to https://discord.gg/PEf83pz and say hello! We are also in the process of getting our official Xbox club up and running. During the beta, you will be able to explore the regions of Balenos and Serendia. Explore the quaint town of Velia or the bustling city of Heidel where you can pick up a wide range of goods from merchants. Every nook and cranny of these regions are available for you to adventure through. You will also be able to get a taste of nearly everything Black Desert has to offer, including most of the Life Skills that Black Desert is famous for. Gathering, processing, cooking, alchemy, training, fishing, trading and farming will all be available in the beta. 6 Classes, Berserker, Ranger, Sorceress, Warrior, Witch and Wizard, will be playable during the beta. The level cap for beta has been set to level 40 so that you can get a good grasp of each class before it ends on November 12th. There will also be a whole host of events for you to enjoy. From catching horses to cart racing, these events will be run by the team here at Pearl Abyss. 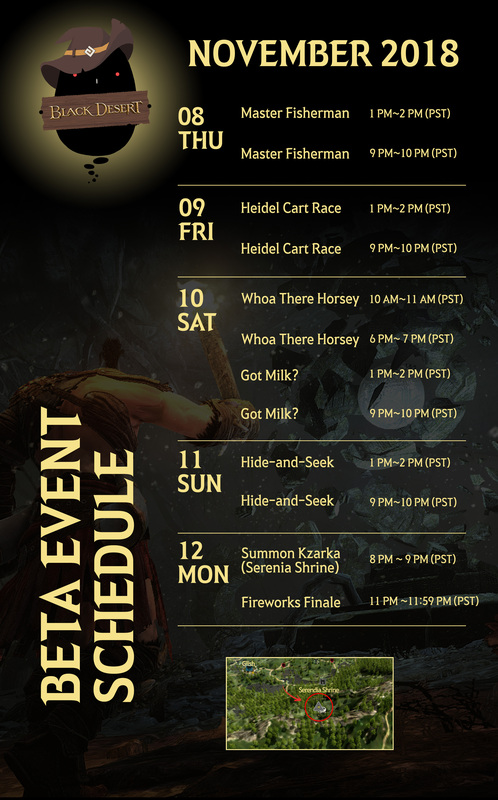 This will be your chance to have fun with us in Black Desert with some of the minigames that are scattered throughout the world. For more information regarding the GM Events, check out the timetable below. During your playtime in the Black Desert Beta, you will receive special character cards that can be redeemed for all kinds of items. Every player redeeming their cards will also help to unlock special items including a Tier-6 horse and a fishing costume that everyone can enjoy during the beta. You can also help kickstart your adventure at launch by reaching the 100% mark for each card which will give you items when the game launches! For more information, check out the image below!